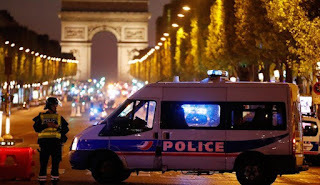 A killer who shot dead one police officer and seriously injured two others in Paris this evening had previously been jailed for opening fire on law enforcers, and talked of his desire to kill police on social media. The 39-year-old, named in reports as Karim C, and using the alias ‘Abu Yousuf the Belgian’ made dark threats on messaging app Telegram, it has been claimed. He was convicted for a 2001 shooting which left two police officers seriously injured, according to reports, and was given a 20 year jail term. French authorities have confirmed that the shooting close to the Champs Elysees was a ‘targeted’ attack, and prosecutors have opened a terrorism probe. ISIS has claimed responsibility for the attack, which was carried out with a Kalashnikov weapon. A passerby was also injured. French President Francois Hollande has said he is convinced that the attack was ‘terror related’, and will hold a security cabinet meeting in the morning. The gunman was shot dead at the scene. The gunman has been named in Le Parisien as Karim C.
The French-born killer lived in Chelles, a commuter town close to Paris in the Seine-et-Marne department. In 2003 he was sentenced to 20 years inside a high security prison following the attacks in Roissy-en-Brie, also in Seine-et-Marne. But he was let out early following an appeal ruling, giving him the freedom to carry out tonight’s attack. Karim C was the registered keeper of the grey Audi used in tonight’s attack. A raid on his home later found guns and ammunition, said intelligence sources. He had targeted a parked patrol car full of traffic control officers working to theParis [sic] prefecture. The officer killed was at the wheel and was having an evening snack at the time ofhis [sic] death. French television network BFMTV reports that he had used the Telegram internet messaging service, which extremists have previously been claimed to favour because of its encryption….